The last time I booted up Disney Infinity, it was April of last year and the game hadn’t yet gotten the axe. I had just gotten the Inside Out playset and spent a very enjoyable weekend day running around in it. It stung even more when I put the Finding Dory playset piece on its base and got a little ways into it, because it is really obvious that the folks at Avalanche had finally gotten to break out of their rut when they made it and I really want to see what they were planning to do with Moana and the other stuff they were working on. THIS IS METROID. WITH FISH. So I played through What-if-Samus-Was-A-Super-Scatterbrained-Blue-Tang, and then I started looking for other playsets I hadn’t completed yet. 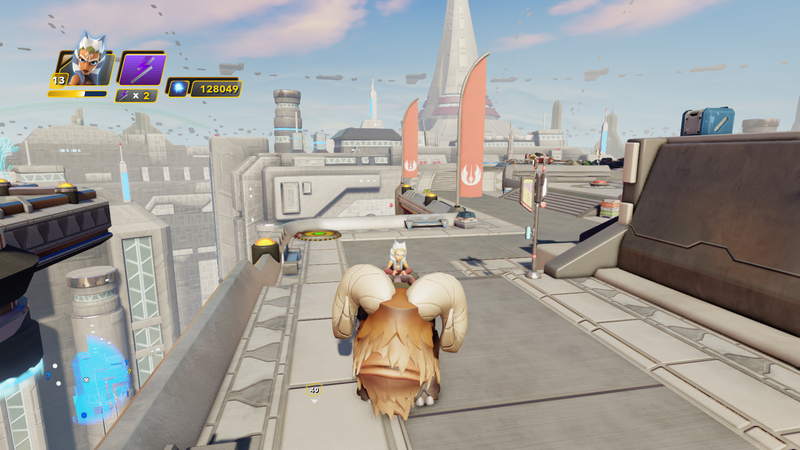 …in this image, I am riding a Bantha on Coruscant, having just found all of its babies and delivered them to a pen for safety. In the main storyline, someone is trying to build an army of killer robots. I’ll get back to those killer robots soon enough, but right now it’s time to herd Banthas. And, there are low spots. Like, the last level, where you are guided through the entire level by, God, I’m not even going to type the name, I’m just going to put a couple of screenshots here and you can imagine the pain. All dialogue is fully voiced, by the way. If you are masochistic, you can read these to yourself in HIS voice. …so, if I’m honest, that was a bit of a low point. It was, at least, followed by a REALLY good boss fight to wrap up the playset. That brings us, then, to the final playset on my stack, and the one that really shows what could have, and should have been done with the franchise, because it’s Toy Box Speedway, a game in which you can take any of your Disney Infinity figures, and stick them in karts based on a weird mix of the game’s franchises, and race around any of nine tracks based on different Disney properties, and it makes no sense at all but when I am drifting around the streets of San Fransokyo as Quorra from Tron: Legacy riding the log from the Splash Mountain ride at Disneyland and firing machine guns at Hawkeye in his little go-kart, it doesn’t have to make sense. It’s too pure, too beautiful for this world. Nothing gold can stay. It supports local co-op, at least, so even though the servers are shut down and buried it will be something I can drag out the next time I have a friend over. Ironically, the last bits of Disney Infinity stuff I have yet to play are the sets that came with Disney Infinity 1.0, because I didn’t get in to the game until they put out the Marvel characters. That’s for another time.